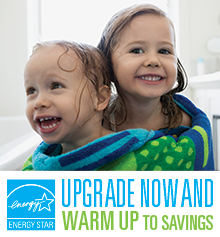 Using sunshine to heat or preheat your water can cut your annual hot water costs in half. An ENERGY STAR certified solar water heating system can cut your annual hot water costs in half, and is generally designed for use with an electric or gas back-up water heater. What else should I look for when buying a solar water heater? If you are interested in an ENERGY STAR qualified solar water heater for your home, consider the following before you buy. Be sturdy with the shingles in good condition. If your roof isn't appropriate for a solar water heater, but you have suitable unshaded land next to your home, you may want to consider a ground-mounted system instead. Review your roof warranty, if you have one, to determine if and/or how installing a solar panel can affect this warranty. Make sure the contract requires the contractor to repair any leaks or damage to the roof during installation or operation caused by their work. Understand how solar water heaters work so you can discuss which collector type and circulation system makes the most sense for you. Protect against freezing in colder climates. Some solar systems are appropriate for freezing climates, while others are not. As a general rule, if there is a good chance that temperatures will fall below 42°F, choose either a closed-loop system with antifreeze as the heat transfer fluid, or a system that automatically drains back when temperatures fall too low for comfort. Steer clear of batch systems if you live in a climate with distinct winters. Contact a Solar Contractor or Manufacturer. Installing a solar water heater on an existing home requires careful installation, which often includes running pipes through walls. You will want to find a local contractor who can assess your site, provide recommendations, install a system, and then perform periodic maintenance. Use a contractor certified by the North American Board of Certified Energy Practitioners (NABCEP) if possible. Collector is clean and not shaded. Collector is sound, sealing and glazing are not cracked or yellowing. Fasteners connecting collector to roof are sound. Piping and wiring are well-connected, well-insulated, and without damage. Pressure relief valve is not stuck completely open or closed. Pumps (in active systems) activate when the sun is shining. Pipes are free of mineral build-up. If you live in an area with hard water, you may need to add de-scaling agents to the water every few years. For example, you can run a vinegar solution through the collector or hot water loop every three to five years. Consider other measures that may also save energy. If you are in the midst of new construction or home remodeling project, you may have come across other proposed approaches to water heating. Under the right circumstances, these technologies can save significant amounts of energy.